Have you been doing research on Jinhua Yongan Electronic Electrical Appliance Manufacture Co Ltd located in China sells Electronic Security Devices? If so, read on below to read one buyers experience when trying to buy Electronic Security Devices. All of a sudden, this company has stopped communicating on all requests which include re-orders for private label products as well as development updates on new designs. We have had no prior notice of a change with regards to the management of the company or our contact person. It is as if the company has ceased to exist. We have approached various staff members via email, and have not received messages back for several months from anybody. A total radio silence is what we experience. To our knowledge, there is no reason for this behavior. We always had a good relationship with this supplier and payments and deliveries were without a problem. In case of quality issues, the supplier acted swiftly. We have dealt with many Chinese suppliers over the past years. This is an exception, but one that we did not anticipate at all. A supplier that stops all communications and deliveries/orders without prior notice. Make sure there’s always a plan B, and never be dependent on just one supplier. Need More Info on Jinhua Yongan Electronic Electrical Appliance Manufacture Co Ltd? 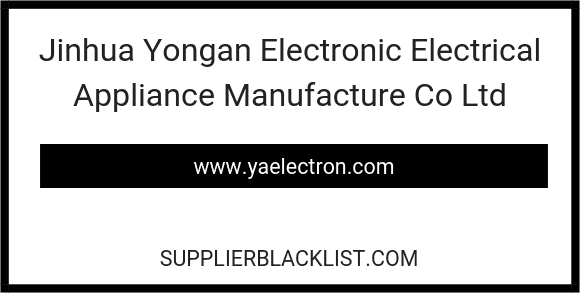 If you need more information, you can click the below links to search for more submissions about Jinhua Yongan Electronic Electrical Appliance Manufacture Co Ltd on Supplier Blacklist as well as go to the search results page on Google for more reviews online about this company. Perform a Supplier Blacklist search for more reviews on Jinhua Yongan Electronic Electrical Appliance Manufacture Co Ltd.
Search Google for Jinhua Yongan Electronic Electrical Appliance Manufacture Co Ltd Reviews.